It has been a long time since I have brewed anything. My last brew day was Summer Somewhere 2016. That batch is still in the secondary because I have been both busy and lazy. Andy's younger brother AJ usually stops by when we brew all-grain batches at Andy's house. AJ is turning the big 3-0 at the end of July and wanted to brew a birthday beer. He thought a Belgian-style tripel would make sense. Thirty, tripel, get it? A tripel is a high alcohol, yet light-bodied beer. The grist is pale and/or pilsner malt, with sugar used to lighten the body and increase the amount of alcohol. Traditional examples do not exhibit a ton of hop flavor. Most of the flavor in the beer is produced by the yeast and the alcohol. The margin for error is very small without the presence of dark malts and/or dry hops to cover up any flaws. When working on the recipe it became clearer how difficult the beer would be to brew. We would need to use Lactic Acid to lower the pH of the mash because the lighter malts in the beer are less acidic than darker malts. The beer would need to mash for 90 minutes to ensure the wort would be as fermentable as possible, and the beer would finish dry. The boil would also need to be 90 minutes for several reasons: minimize DMS which Pilsner malts can be more prone to, this would allow us to sparge for longer and get more fermentable sugars from the grain, while boiling down the extra wort produced. We would need a big yeast starter to ensure the fermentation is as complete as possible. If the beer has too much body it won't be as drinkable as it should be. The beer would have to ferment in the mid 60s, at least initially, to make sure the alcohol in the finished beer isn't hot, harsh, and solventy. We don't have a temperature controlled fridge or freezer, but Andy's basement should be cool enough. AJ threw this out there at the end of May. To have any chance of having the beer be ready for AJ's birthday it would need to be brewed sooner rather than later. We tried to figure out a day in late May or early June where we could brew, but there wasn't a day that could work for everybody. Ultimately Andy and AJ brewed this one without me, while I was at Sierra Nevada Beer Camp in Boston. To make the brew day as easy as possible I printed the instructions, pre-measured the water salts, gave Andy a crash course on using the pH meter and adjusting the mash pH with the lactic acid, and made a yeast starter the night before. I asked Andy how the brew day went. They mash temperature may have been a little low. Andy was using a digital thermometer, and his cat ate through the cord which connected the probe to the display. They ended up pulling off some of the wort, heating it up, and adding it back to the mash to try and compensate. I'm sure I'll be there when it is time to rack and bottle. The beer should be ready for AJ's party, but it will probably improve with more time to mellow in the bottle. I will probably bring a couple of kegs to the party to share as well. Jennie and I both went to the conference. Initially I felt that Jennie was hesitant about going. Not that she wasn't going to go, but I don't think she was convinced she would have fun. Homebrewing started as something for us to do together, but over time I became more consumed with the hobby. It became more my thing than our thing. She wanted to do a some touristy type things on our trip. Jennie wanted to visit Washington D.C., attend a Washington Nationals game, and attend an Orioles game in Baltimore. The schedule didn't work out for us to visit Nationals Park, but we did spend a night in Washington. We took the Bolt Bus from Boston to New York to DC. We had just enough time to walk around the National Mall and all of the monuments before dark. 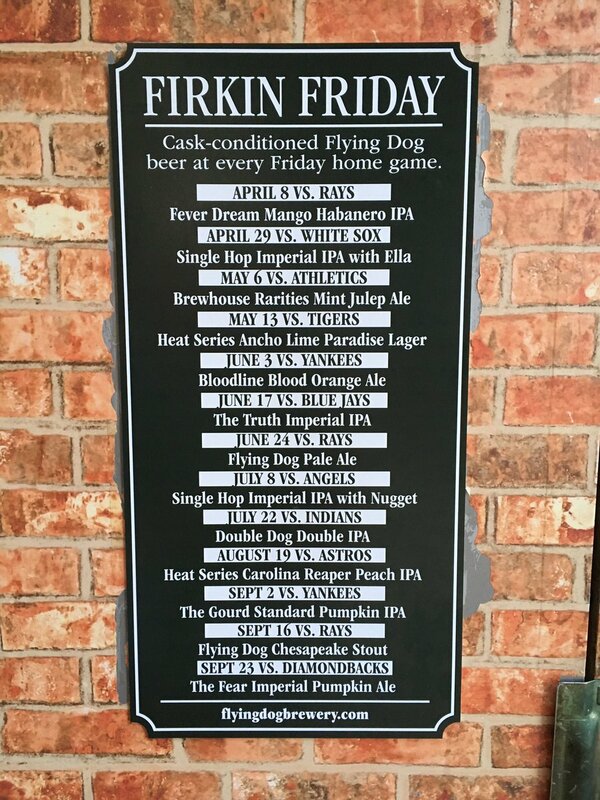 After walking and dealing with screaming kids, we went to Meridian Pint and enjoyed several beers off their superlative draft list including Abraxus by Perennial Artisan Ales. The next day we took the train up to Baltimore and just made it to the BJCP Judge's reception. We grabbed a couple of seats in the dining car and drank a couple of Yuenglings to justify sitting there. At the reception I particularly enjoyed Peter Jones and Michael Stein's presentation about Pre-Prohibition Porter. After the reception wrapped up we checked into our hotel, unpacked, and relaxed before heading down to Camden Yards to see the Orioles and Royals. Before the game we stopped off at Pratt Street Ale House for food and drinks before the game. The bar was formerly the production facility and brewpub for Oliver Brewing Company. I enjoyed their traditional English styles. Any brewery that produces a Dark English Mild gets a thumbs up emoji from me! Located across from the convention center where Homebrew Con was held, we actually went back to Pratt Street the next night when we wanted a quick bite between events. We had great seats in the lower bowl behind home plate for the game. The craft beer situation at Camden Yards compares favorably to Fenway Park. The park had plenty of craft beer stands featuring numerous beers from local staples Heavy Seas, Flying Dog, and Du Claw on draught, as opposed to Harpoon, Sam Adams, or Wachusett maybe having one or two beers to choose from. One Heavy Seas stand featured "Firkin Fridays" that featured Heavy Seas beers on cask. Beyond that, there were beer vendors in the stands throughout the park, as opposed to Fenway where they are only in the first few rows. Prices were similar to Fenway. The concourse at Camden Yards are at least three times the size of Fenway Park which probably gives the Orioles more room to serve more beer. Inside the old B&O Warehouse over the right field fence is Dempsey's Brew Pub and restaurant. Open after the game ended, we figured we would check it out. The place was really nice with lots of TVs, great staff, and some solid local craft beers in bottles. The house-made beers were disappointing. We tried the IPA and Golden Ale. I honestly think these recipes were designed to make oriole orange beer, and everything else was an afterthought. We probably made it back to the hotel by midnight. I had to be up early to judge at the final round of the National Homebrew Competition! Homebrew Con, formerly known as the National Homebrewers Conference (NHC) is the American Homebrewers Association's (AHA) largest event of the year. Spanning three days of seminars, exhibitions, and trade shows Homebrew Con is truly an epic event. When I first learned of the NHC it didn't sound like something I would be interested in. Traveling to another city for a conference felt a little stuffy. I wasn't advanced enough in my brewing that I would want to sit down and listen to highly technical seminars about beer I might not understand. From reading Brulosophy and other blogs, and the BeerSmith podcast it became clear the NHC was not what I thought it was. Other brewers felt the same way which was why the AHA re-branded the NHC as Homebrew Con. As soon as I saw that Homebrew Con 2016 would be in Baltimore I decided we had to go. I spent the summer of 2004 in the area and looked forward to going back. Baltimore is a manageable eight hour drive which made attending more affordable. The AHA lined up discounted rates at numerous hotels within walking distance of the convention. We were able to book a suite a ten minute walk away for less than $200 a night. When I saw how much it would be to park my car at the hotel we decided to take Bolt Bus down. In addition to Homebrew Con itself, there were numerous other events going on in Baltimore during convention week. 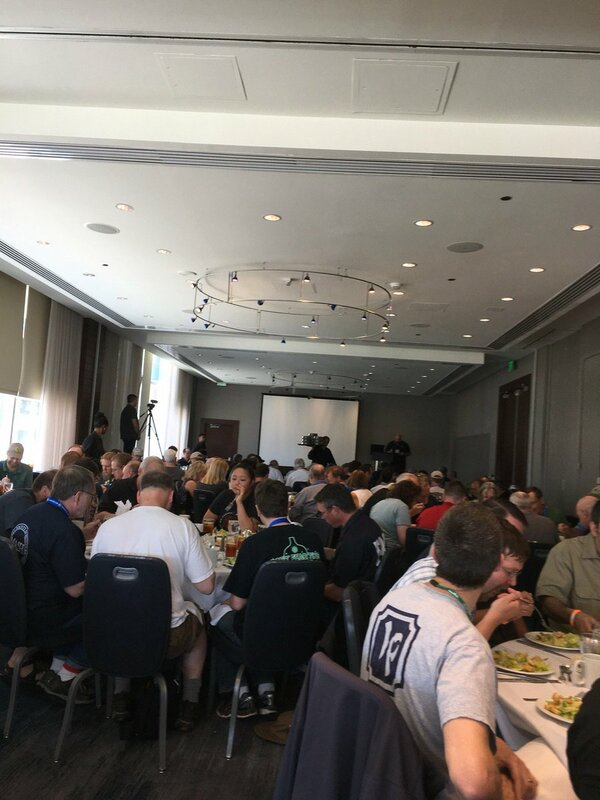 The final round of judging for the National Homebrewing Competition coincides with Homebrew Con week. Additionally the Beer Judge Certification Program organizes several events of its own. When we decided to go I wanted to do everything! Who knows if I would ever be able to attend another Homebrew Con? The convention was in Baltimore this year and it will not likely be back on the East Coast again for several years. I wanted to make the most of the entire experience. The week went by so quickly. For two days after it was over I was actually, literally sad. There's a lot to cover. Check this space for all the details this week! It seems like whenever I brew something that comes out exactly how I wanted, or is at least pretty close to how I wanted, the beer is gone in a day. This was what happened when Andy and I brewed the first batch of Pa's Video Board Lager. The extended Chalifour family kicked the five gallon keg in less than a day. This was also the case with my three gallon batch of Broken Fist IPA. I brewed exactly three gallons, just enough to fill one of my three gallon kegs. Without the ability to chill and force carbonate, I added some priming sugar to the keg and carbonated the beer naturally. Even when keg-conditioning I typically like to purge the kegs with CO2 to help the beer maintain as much freshness and eliminate as much oxygen in the keg as I can. Sure enough, my CO2 tank ran out of gas on packaging day. All I could do was fill it up, prime, and hope for the best. On Memorial Day weekend I picked up ingredients for my next collaboration with Andy, and swapped out my tank to serve Broken Fist and the Wisconsin Belgian Red clone on Sunday. When I tapped those kegs it was the first time I had tasted the finished product of either beer. I was scared that something went wrong during conditioning and the beers could be infected. I made sure to bring a case of Newburyport beer as backup. After the first foamy solo cup, the beer had a nice carbonation and hop aroma. I couldn't escape the feeling that the hop aroma would have been more pronounced if I had purged the keg. The beer wasn't too bitter, and had a nice balanced mouthfeel. If anything, the beer could have used a touch more hop bitterness. The hop flavor was citrusy, while the malt provided enough balance. The fermentation character was nice and clean. The hops were the star, and the beer did have a "West Coast IPA" feel. I grabbed a tasting glass so I could see the beer before it was all gone. The color was on point. The clarity was disappointing. I think I need to start using gelatin, or biofine as Jennie doesn't eat red meat. I disassembled my jockey box, and soaked all the lines in a hot cleaning solution. Ideally I would have run the solution through the lines. That might have also caused haze in the beer as well. The beer tasted fine. The appearance is just something the perfectionist in me wants to improve. Adam loved the beer. Andy stopped by later on and enjoyed the beer too. My future cousin Corey filled up his red solo cup multiple times. The consensus was this beer is a keeper. I might increase the hop rates a little bit, but the bones of a new house beer are definitely there.